There is nothing quite like the asphalt infrared industry segment. Itâ€™s simple, itâ€™s complicated, itâ€™s new, itâ€™s old. Itâ€™s effective and versatile. Over its 30-year history, infrared has had a herky-jerky growth curve, and nobody knows why. It is clearly a four-star process improvement over older methods, itâ€™s economically viable, it is not complicated, yet thousands of government departments still do not specify it. Process review â€“ what is it? There are many uses for infrared, including thermography, photography and actually re-heating asphalt pavement in place. Here, we are focused on infrared heating of in-place asphalt. Basically the principle is to use an infrared heating unit to safely, fumelessly heat in-place asphalt to soften it to a workable state, then add new asphalt which fuses seamlessly to the old. The most popular example of the technology is in pothole repair. As compared to the old saw cut method, where a square of damaged asphalt is cut out, removed and filled with new, the infrared method eliminates the seams that quickly ruin such patches. Saw cut seams permit rainfall to enter, which quickly introduces moisture and freeze/thaw damage into the patch. Many such patches have to be redone every year. There are a number of leaders in the asphalt infrared industry from different segments Â¬ manufacturers, users and beneficiaries of the process. Here is how some of the manufacturers see their industry. KM International, http://www.kminfrared.com, was incorporated in 1983 as Keizer Morris, when the only available infrared machines cost upwards of $75,000. They saw the opportunity to provide machines at lower cost, to allow smaller contractors access to the process. Today, one of their leading units is the model KM 4-48. The company also makes a line of asphalt hotbox reclaimers that offers contractors a convenient option for heating product on the fly. â€œWith prices ranging from $6,000 up to an investment of $22,000 contractors can enter the world of asphalt recycling and repairing whether it be as an integral profit generating segment of their existing asphalt maintenance business, a service to a large-scale paving operation or a stand alone entry into the field of asphalt repair,â€ explains Burke. Joel Marshall, director of sales and marketing for Asphalt Reheat Systems, in Madison, Wis., agrees. Asphalt Reheat Systems, http://www.asphaltreheat.com, was founded by David Strassman originally to provide heat for asphalt stamping applications and has since branched out to serve many areas of the industry to help contractors improve their profits. The company manufactures units that actually use radiant blue-flame technology to heat the asphalt. Its best-seller is its series of portable units, ranging from 4- to 16-square feet heating capacity. â€œWe want contractors to know that they can actually save money using infrared for pavement maintenance repairs. In many cases, youâ€™re looking at the difference between four or five workers spending hours on a cut and saw repair, where the same repair is accomplished with better quality by two workers in 20 minutes time. That kind of savings is crucial to any contractorâ€™s bottom line,â€ Marshall concludes. Roger Filion, president of Kasi Infrared, in Claremont, N.H., confirms that a typical 5 x 7 ft. infrared repair can be reopened to traffic immediately after 20 minutes of work. 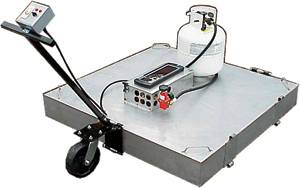 Kasi Infrared makes infrared pavement heaters as well as asphalt storing, recycling and hauling equipment. On Kasiâ€™s web site at http://www.kasiinfrared.com, they have a profit scenario for infrared, based on daily production of 600 square feet per day billed at $2.50 per square foot. It plays out to more than $200,000 annual profit after equipment, supplies and personnel expenses. â€œConsider the savings in manpower, time, machinery and materials by not having to cut out, remove, replace, transport and dispose of large quantities of asphalt. In addition, the end result is a seamless restoration that is thermally bonded to the surrounding pavement,â€ asserts Filion. According to Bob Kieswetter, P.E., president of Heat Design Equipment Inc., of Kitchener, Ontario, the market for infrared products is contracting companies of all sizes. It is a cost-effective addition of technology and service to any size company or department of transportation. A real potential is using infrared heat to pre-heat recycled asphalt being used for production in an asphalt plant. Present technology reheats using standard open flame burners that burn the light oils out of the asphalt and â€“ more seriously â€“ create a significant pollution problem. Using infrared allows a uniform, steady temperature rise without overheating the asphalt bitumen. 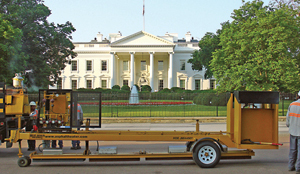 A major focus for Heat Design Equipment, http://www.asphaltheater.com, is its longitudinal joint heater that creates seamless joints for new paving projects. The time for clinging to old, cheap methods that fail every year is past. It is no longer acceptable to the general public, or to transportation authorities to use â€œhere today, gone tomorrowâ€ repairs, ignoring things like asset management, sustainability, carbon emissions, noise pollution, recycling potential, highway safety or employee safety. Infrared addresses all these issues and others, like quality assurance and even attractive results. In a small, unscientific random sampling of specification sheets for various departments of transportation, only a tiny percentage mention infrared jobs, and many donâ€™t appear to use it at all. This is the great curiosity of infrared technology. Why donâ€™t authorities specify infrared projects? Some say that while they donâ€™t specify it, some of their larger contractors just take the initiative to use it to complete projects as they see fit, while a handful of others have purchased their own infrared systems and keep their own crews busy with infrared. Thus, it becomes a big part of any contractorâ€™s research into infrared to find out the position of local road authorities on the use of infrared. This asphalt industry is inherently conservative. The long-range expectations of asphalt roads, bridges, parking lots, driveways and so on to last a long time â€“ combined with the long time frames required to verify results â€“ puts pressure on the industry to relentlessly test new concepts and approach new technology with trepidation. No doubt there is still a great deal of misunderstanding about the infrared process among contractors as well as specifying authorities. For example, the fact that infrared technology is not suitable for correcting sub-base failures may cause some to throw out the notion of infrared altogether. Most failures, however, are not in the sub base, but in the surface courses, where infrared performance literally glows. As recently as 2004, the Federal Highway Administration recommends using an open flame propane torch to prepare asphalt pavement for thermoplastic signage and markings. Even the web site of AASHTO, whose members are officials of all 50 statesâ€™ highway departments shows a paltry six results for a search of â€œinfrared,â€ and none refer to heating asphalt pavement! Filion points out that in 1996, there was only one infrared machine in the entire state of New Jersey. Today, there are 60.
â€œOne of the greatest challenges for the infrared industry is unfamiliarity with the infrared process among professional pavers, and expanding the knowledge about the infrared process and the quality of infrared repairs to paving customers,â€ he declares. When it comes to driveway and parking lot contractors, the advantages of infrared are in cost savings and delivering superior results to facility managers and homeowners. For example, infrared heat is the ideal process to use for mating driveways to garage entrances, controlling smoothness and proper drainage. Probably the most exciting uses of the infrared process are found in asphalt stamping and patterned surfaces, as well as the application of thermoplastics for decorative projects. There is no question that this market segment is on the move. â€œFor example, infrared repairs are ideal for fast-food restaurants and 24-hour markets because the process can be expedited quickly during low traffic times, which is obviously important to the restaurant and mart operators,â€ says Burke. Utility work is made for infrared processes. Utility joint repairs, manholes, tricky drainage areas, high spots, catch basins, grade control â€“ all these types of custom work that are out of the range of the big paving trains are perfect candidates for infrared treatment. Big pavers also have a hard time creating durable longitudinal joints between lanes. According to Marshall, the only way to achieve adequate bonding and compaction at the longitudinal joint is if the adjoining seam is hot. â€œInfrared systems can heat the longitudinal joint directly before the adjoining asphalt is laid to achieve sufficient compaction and high joint density along the seam,â€ he says. It will require the intentional effort of all involved parties to raise the profile of infrared asphalt repair. Manufacturers, paving professionals and satisfied customers alike need to actively spread the word about the advantages of infrared technology. For more articles from Allied Paving Equipment Magazine go to their website at http://www.alliedpavingequipment.com.